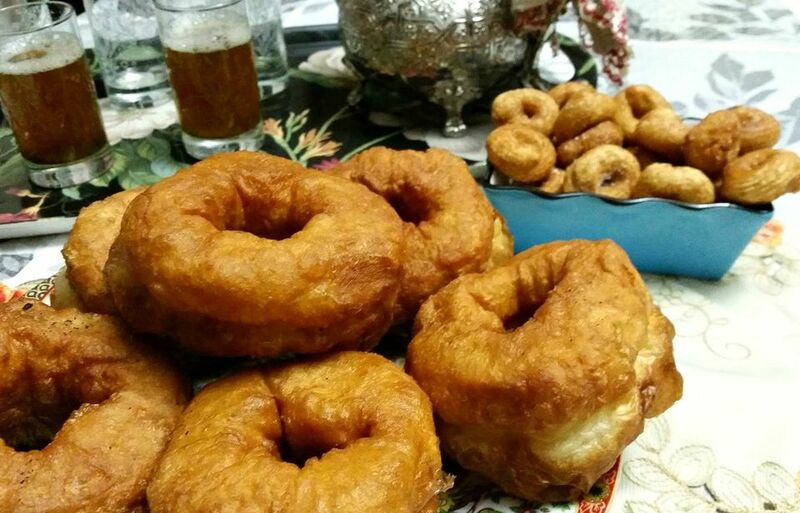 Sfenj is a fritter-like Moroccan doughnut made from a sticky, unsweetened leavened dough. Once it has risen, handfuls of dough are shaped into rings and deep-fried until golden and crispy with a chewy, fluffy interior. You can dust with sugar, if you like, or simply eat as is. In Morocco, the task of making sfenj is usually left to street vendors who cook your order on the spot, often using skewers to remove the freshly made sfenj from the oil. For extra crispy texture, some customers request that the cooked doughnuts be flattened or smashed and returned to the oil for second frying. In a small bowl, dissolve the yeast in 1/4 cup warm water and set aside to proof for 10 or 15 minutes. In a large bowl, combine the flour with the salt and 1 cup warm water. Add the yeast mixture and stir vigorously with your hand or a heavy wooden spoon until smooth. The dough should be too sticky to knead or shape, almost like a thick batter. Cover the bowl with a towel and leave the dough to rise for 3 to 4 hours, until double or triple in bulk. In a wide, deep pot, heat 2 to 3 inches of vegetable oil over medium heat until hot. Set out a bowl of water. Dip your hands in the water, then pull off a piece of dough about the size of a small plum. Use your fingers to make a hole in the ball of dough, stretch the hole wide to make a ring, and place the dough in the hot oil. Repeat with additional portions of dough, until you've added as many sfenj as will fit comfortably in your pot; do not overcrowd. Wet your hands as necessary to keep the dough from sticking as you work with it. Fry the sfenj until golden brown, turning once or twice. Remove the cooked sfenj to a plate lined with paper towels to drain. Repeat shaping and frying until you've used up all the dough. If desired, finish the hot sfenj by dipping in granulated sugar or by dusting with powdered sugar. Serve the sfenj hot or warm; they lose their texture and appeal when cold. Sfenj will not stay fresh very long at room temperature; it's best to freeze leftover sfenj and then reheat in the oven when needed. Sfenj is best-enjoyed piping hot or warm, so if they've cooled before serving time, do reheat them briefly in the oven. They may be served plain or dusted with sugar for breakfast or tea time. Moroccan mint tea is the typical beverage of choice. The key to crispy and light doughnuts is making sure you are frying at the right temperature, which is 365 F. It is best to use a deep-fry or candy thermometer to help maintain the temperature and know if you need to raise or lower the heat. It is natural for the oil to drop in temperature right after you add the doughnuts, and for the oil temp to rise over the course of a few batches, so keep your eye on the thermometer.